Melbourne was the penultimate location for the Capricorn Society’s national trade show and gala dinner road show for 2017. The trade show as held at the Melbourne Convention & Exhibition Centre and attracted 72 suppliers and the buzz of excitement was self-evident as soon as we entered the hall. Suppliers were there to support the Capricorn members, share their latest offerings, enjoy the Capricorn hospitality and of course to do business – and as we moved around the hall it was clear that they were truly enjoying themselves and they took pride in both their booths and their messages. There was even a special bonus rewards points deal on offer to stimulate demand. 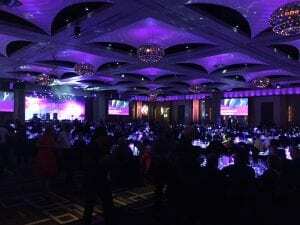 In the evening the event moved to the premium Melbourne venue, The Crown Palladium, for the Gala Dinner and with 1,000 members and guests in the room it was truly a sight to behold. Whilst the focus of the evening was fun and entertainment, there were a couple of short formal presentations that outlined a very impressive year indeed. CEO Greg Wall then took to the stage and shared that 656 new members joined the Capricorn family, together with 29 new preferred suppliers. He then went on to talk about some of the Group highlights. Capricorn Risk grew 16%, Capricorn Finance provided $21m in loans and members booked $5.9m in trips through Capricorn Travel. Greg also acknowledged that Capricorn celebrated 20 years in NZ and had a satisfaction level in the 92nd percentile from their Preferred Supplier Survey. He concluded by reinforcing the importance of the Capricorn service data and the free vehicle videos that further support the members. He thanked the Capricorn team, members and suppliers for another outstanding year of results and growth. The full report on the trade show and gala dinner will be in the December issue of the National Collision Repairer magazine.